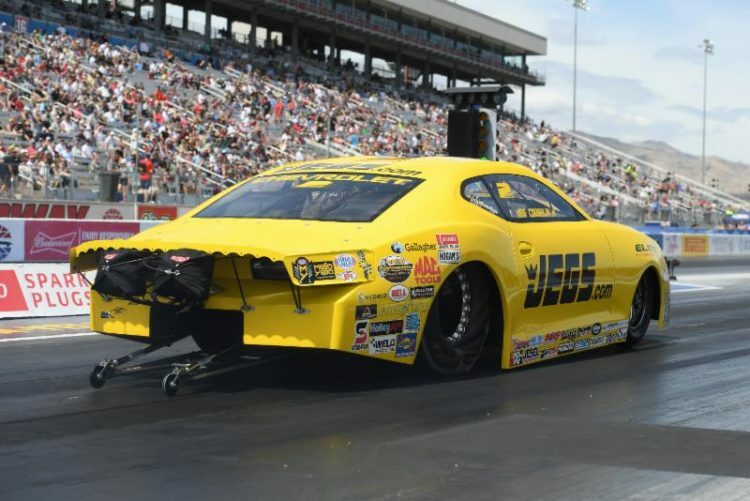 In just his second race behind the wheel of a brand-new 2019 Rick Jones Racecars Chevrolet Camaro, five-time Pro Stock champion Jeg Coughlin Jr. and his JEGS.comElite Motorsports crew already have a great handle on their ride, as witnessed be a stellar qualifying effort at this weekend’s 20th annual Denso Spark Plugs Four-Wide Nationals at The Strip at Las Vegas Motor Speedway. “This morning we came out and made another really good run (6.659 at 206.86 mph) and I think it was one of the top couple of passes that session. And then there in the last session we were the quickest car of all but stayed No. 2 because there just wasn’t quite as much track under us. All-in-all, it’s been a very good outing. ” The switch to a new car was a bit of a surprise to those outside the Elite camp as it came directly after Coughlin’s victory in Phoenix. But the team, which enjoys the tuning talents of car builder Rick Jones and his son Rickie Jones when they’re not making hot rods back home, was supremely confident in the new design. “Obviously, Rickie is very comfortable with the car and is listening to it and fine-tuning it and we will go into race day tomorrow with some good confidence. I am ready to do what I love to do. ” Coughlin will open his bid for a sixth Las Vegas title in a quad of racers that features No. 7 qualifier Erica Enders (6.668 at 205.29 mph), No. 10 qualifier Jason Line (6.679 at 206.10 mph) and No. 15 qualifier Alan Prusiensky (6.770 at 203 mph). In the past, Coughlin captured the trophy at the spring race in 2000, 2001 and 2009, and the fall event in 2002 and 2008. None of those wins came under the four-wide format, where the two quickest racers advance from each quad.